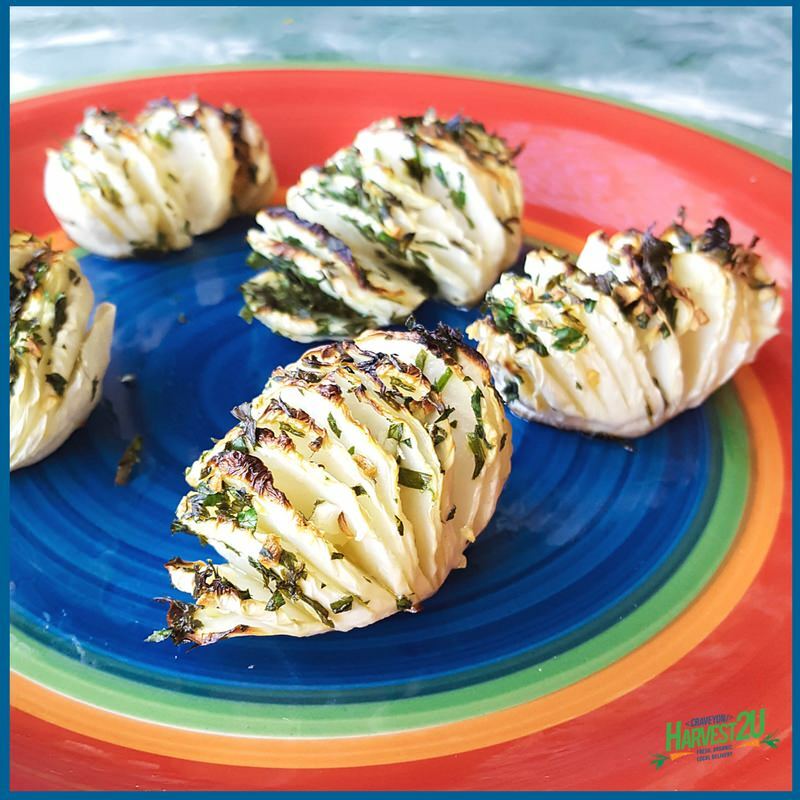 Hasselback Turnips – Less Carbs and Calories Than Potatoes. Why save the Hasselback technique for just potatoes when you can have Hasselback turnips? It works deliciously with other organic root vegetables such as rutabagas as well. And if you are counting carbs or calories, these vegetables have less than potatoes. Turnips are high in vitamin C. The leaves (“turnip greens”) are an excellent source of vitamin A, vitamin C, folate, vitamin K, and calcium. The only challenge to making them is to only slice 75% of the way through the turnip (or potato or rutabaga). One trick is to place a wooden spoon handle next to the turnip to stop the knife from going all the way. If you do unintentionally cut all the way through, it isn’t the end of the world, just cozy the two pieces together on the pan before baking. Slice the top end of the turnip flat and peel. Place the flat side down and thinly slice turnip PARTIALLY through, leave at least 1/4 inch on the bottom intact. Stuff garlic and herbs between the slices. Drizzle with olive oil. Bake until turnips are soft, 20-30 minutes depending on size. If desired, broil for 1-2 minutes to brown the tops.